Among the New Year online poker promotions available from the leading poker sites, Carbon Poker´s $10,000 added Freeroll Frenzy stands out as one of the best. Carbon Poker has taken the Season of Goodwill to all Men to new heights this month, with a series of special promotions running throughout January. The site is maintaining its 200% match bonus on first deposits, doubling up its Sunday Majors tournaments and hosting a $10,000 value added “Frenzy” tournament on January 26th. The “Frenzy” tournament stands out among the January promotions as it has a starting prize pool of $10,000, which increases by $1.00 for every player who enters it – whether they pay $1.00 on the day to participate in the tournament (no tournament entry fee), qualify through one of the site´s nightly freeroll satellites or enter using their existing Carbon Poker VIP Points. The Frenzy tournament will start at 16:00 ET (9.00pm GMT) and will have late registration available for 4 hours and 10 minutes (end of Level 22), by which time the blinds will be up to 3,000/6,000 (ante 600); so late registrants will have to work some magic with their 3,000 chip starting stack! During the late registration period, players can re-enter as many times as they wish – adding further funds to the prize pool, even if they re-enter using an additional ticket they have won in one of the Frenzy Freerolls (details below). Busted out players will know whether they are still in time to re-enter, as a recent software update has introduced a pop-up window which invites players to get back into the action when they are eliminated from a re-entry tournament and late registration is still available. Each evening up to January 26th, Carbon Poker is hosting a “Frenzy Freeroll” tournament in which 25 seats to the target event are awarded as prizes. The freeroll qualifier is played at 19:00 ET (Midnight GMT) and the number of players that can enter is restricted to just 250. Consequently there is no late registration or re-entry available. Registration for the freeroll qualifier opens 30 minutes before the tournament gets underway, so there is likely to be a “registration frenzy” as players clamour to get involved in the tournament. At the time of writing, the first prize in the Frenzy final stands at $1,950 with the bubble being 158 players deep and a min-cash worth $18.66 – not bad for a tournament players can qualify for through a freeroll! 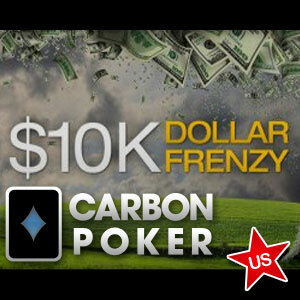 Throughout January, Carbon Poker is offering a 100% reload bonus on deposits up to $500.00 (minimum $35.00). The usual terms and conditions apply to clearing the bonus, which is credited to players´ accounts in increments of $10.00 as they collect Carbon Poker VIP Points – the points can then be used for further cash rewards or tournament entries, such as the $10K Dollar Frenzy event. The Carbon Poker bonus code to take advantage of the reload bonus is “JANPK”, and players have 60 days from the date of their deposit in which to redeem the bonus or as much of it as possible (players making their first deposit at Carbon Poker can qualify for a 200% match bonus on deposits of up to $2,500 by using the Carbon Poker bonus code “FREE10PK”). The reload bonus and $10,000 added Dollar Frenzy tournament are just two of the great promotions that are taking place at Carbon Poker over the next month. If you have not visited the site for a while, there has never been a better times to play at Carbon Poker.